Since September, police have arrested dozens of journalists and activists around the country for the “crime” of trying to document political protests in public spaces. People with smartphones and cameras are changing the way we record and share breaking news. In return, police have targeted, harassed — and in many cases, arrested — those trying to bear witness. Whether you’re a credentialed journalist, a protester or a bystander with a camera, you are guaranteed freedom of speech, freedom of assembly and freedom of access to information. In the digital age, these freedoms mean that we all have the right to record. Free Press and a coalition of free speech and digital rights groups have sent a letter urging Attorney General Eric Holder and the Justice Department to defend this right. Please Join Us and Sign the Letter. 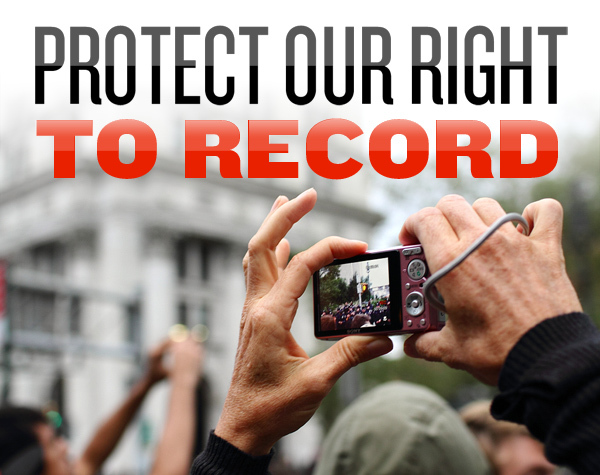 Protect Everyone’s Right to Record. Illustration by Free Press. Original photograph by Flickr user _PaulS_. The First Amendment has come under assault on the streets of America. Freedom of speech, freedom of assembly and freedom of access to information are vital whether you’re a credentialed journalist, a protester or a bystander with a camera. The First Amendment’s protections must extend to everyone. Police have arrested dozens of journalists and activists simply for attempting to document political protests in public spaces. We are calling on the Justice Department to address this widespread abuse and protect everyone’s right to record.